Grangemouth is a town in the Falkirk council area, Scotland. Historically part of the county of Stirlingshire, the town lies in the Forth Valley, on the banks of the Firth of Forth, 3 miles (4.8 km) east of Falkirk, 5 miles (8.0 km) west of Bo'ness and 13 miles (20.9 km) south-east of Stirling. Grangemouth had a resident population of 17,906 according to the 2001 Census. Preliminary figures from the 2011 census reported the number as 17,373. Grangemouth's original growth as a town relied mainly on its geographical location. Originally a bustling port, trade flowed through the town with the construction of the Forth and Clyde Canal in the 18th century. 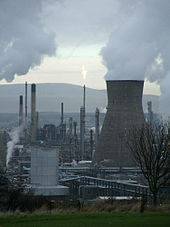 Nowadays, the economy of Grangemouth is focused primarily on the large petrochemical industry of the area which includes the oil refinery, owned by Ineos, one of the largest of its kind in Europe. The town is twinned with La Porte, Indiana. Residents of the town are known as Portonians. Grangemouth was founded by Sir Lawrence Dundas in 1768 as a result of the construction of the Forth and Clyde Canal. Originally referred to as Sealock by workers brought in to labour on the canal digging and lock constructions, the name referred to the Forth and Clyde Canal connection to the sea and where it flowed into the River Forth. This township name was never approved by the founders. The settlement was also named Grangeburnmouth for a period and then finally to Grangemouth. A map held at the National Library of Scotland dated 1817 by John Grassom, records the town as Grangemouth. This more properly refers to its location at the mouth of the Grange Burn which flows into the River Forth at this time even though originally it flowed directly into the River Carron in the late 18th and early 19th centuries. As canal and general shipping traffic came to the town the area became more prosperous. This was aided by the high tariffs at the port of Leith which caused more traffic to pass through Grangemouth instead. Additionally, the dredging and a major re-alignment of the River Carron for deeper draught vessels and the founding of collieries to the North of the town saw the increase in trade to and from the Baltic States. Being downstream from the world-famous Carron Company also increased the volume of shipping to the town as cast iron products and armaments were transported around the globe. Until 1810, duties had to paid on cargoes through the customs house at Bo'ness which benefited from the duties paid and involved a journey of some four or five miles each way. With poor roading between the towns, ships captains and agents had to undertake multiple journeys by foot or by horse and cart to register cargoes and pay their duties in weathers fair and foul. After years of appealing Grangemouth was granted its own Customhouse and a fine three storied stone building was erected on the Northern side of the harbour. The 1830s saw 750 ships in port and over 3,000 trade journeys using the canal. The local shipyard had a graving or drydock built by the Earl of Zetland in 1811 and commenced building larger and larger vessels. The harbour and the river were unable to handle the volume of shipping and larger vessels had to rely completely on the tide to reach wharves on the river bank. A new dock was commissioned to be built and dredging and further re-alignment of the River Carron were undertaken. 200 men dug out what is now called the Old Dock and lock gates were built, allowing vessels to enter the port at any time and tide. A canal link to the south west was named Junction lock and it was also connected to the canal. This allowed timber logs from Scandinavia to be floated in rafts right up to the sawmills almost a mile inland. Over the next 50 years the docks would be increased in size fourfold or more with a major land reclamation in the late 1890s pushing the entrance of the docks to the River Forth and avoiding the Carron with its limited depth and width. There was also Grangemouth Dockyard Company established in 1885. In November 1914 the Admiralty requisitioned Grangemouth Docks and they were banned to merchant shipping for the remaining duration of the First World War. During this period the dock was referred to as HMS Rameses in military circles. A 1936 LMS advert said that the docks had 121 acres (49 ha) of water (excluding timber basins), direct access to the Forth and Clyde Canal ("giving through access to Glasgow and the Clyde") and handled 3,250,000 tons of goods a year. The now re-opened canal no longer passes through the old part of Grangemouth, but joins the tidal River Carron, which has been deepened to allow access downstream to the River Forth for canal traffic. After Sir Lawrence Dundas, 1st Baronet died in 1781 his son Thomas Dundas commissioned the architect Henry Holland to re-plan the town, he designed the layout around the canal and its basin. Sadly, the original two townships were almost totally demolished in the 1960s as a result of poor planning decisions and the blocking of residential development of the harbour area by Stirling Regional Council in the 1950s and '60s.The last vestiges of the original old town were the Institute Building (built 1876) and the nearby Queens Hotel which were demolished circa 2007. Grangemouth Port is one of the main ports in the UK with the largest container terminal in Scotland, with 9 million tonnes of cargo handled through the dock facilities each year. There are links to the inter-modal freight facilities elsewhere in the town which use the town's motorway connections. The main industry of Grangemouth and the wider Falkirk council area is focused on the Grangemouth Refinery which employs a significant workforce and is one of the largest of its kind in Europe. The Soap Works building which was used to manufacture soap and glycerine, and owned by the Scottish Co-operative Wholesale Society was established in 1897. This was the largest works of its kind in Scotland and employed a considerable number of local people. It was demolished in November 2005 to make way for a new Whyte and Mackay blending and bottling plant. Grangemouth has an Air Training Corps Squadron, 1333 (Grangemouth) Squadron (located at the TA Centre in Central Avenue), an Army Cadet Detachment (also in Central Avenue) and a Sea and Marine cadet corps at Grangemouth Docks. There are two general health practices, and a dentist's surgery in the town. The area is covered by NHS Forth Valley and with the recent downgrading of the Falkirk and Stirling Hospitals, all major services have been transferred to the newly built Forth Valley Royal Hospital in nearby Larbert. Grangemouth has four primary schools: Bowhouse Primary School, Beancross Primary School, Moray Primary School and Sacred Heart R.C. Primary School. The former three are within the catchment area of Grangemouth High School and the latter is a catchment primary school for St. Mungo's High School. Grangemouth High School was recently rebuilt with new facilities such as an indoor swimming pool, dance studio, a gym, and an outdoor football pitch. For many years Grangemouth had a three-tier school system - the only area in Scotland to do so. This ended in 1988. Grangemouth has access to three nearby train stations, Falkirk High, Falkirk Grahamston, and Polmont. Grangemouth has an international-standard sports stadium and sports centre. Grangemouth Stadium was built in 1966 for the citizens of Grangemouth, partly funded by BP. The stadium has been extended to host a 150-metre running track, physio room, and weight-lifting. The stadium is used as the National Indoor Sports Stadium and for the Football Referees' Fitness Test for Stirlingshire. It was announced in August 2014 that the temporary running track used at Hampden Park for the athletics programme at the 2014 Commonwealth Games would be installed at Grangemouth Stadium. The Games legacy programme also agreed to donate £30,000 worth of sports equipment to Falkirk Community Trust, which runs the stadium. A number of parks exist in the town which are used for sports and recreational activities. Inchyra Park, which is situated close to the stadium, Rannoch Park in the Bowhouse area which is situated at the point where the Grange Burn flows into the town, and Zetland Park in the centre of the town. Grangemouth Golf Club is actually located in the neighbouring village of Polmont. The town has many amateur football teams, including Zetland AFC, Mahratta AFC and Bowhouse F.C. Falkirk Juniors, who were established in 2011, played their home fixtures at the Grangemouth Stadium before folding in 2016. They competed in the Scottish Junior Football Association, East Region. Many churches are located in Grangemouth: three Church of Scotland, two Catholic Churches, one Episcopal Church and several mission-type churches including a Kingdom Hall of Jehovah's Witnesses. The town's closest mosque is Falkirk Islamic Centre, which is around 3 miles away. Grangemouth is twinned with La Porte, Indiana, US. ^ "2014 Commonwealth Games track moved to Grangemouth Stadium". bbc.co.uk. 21 August 2014. Retrieved 21 August 2014. Wikimedia Commons has media related to Grangemouth. This page was last edited on 23 February 2019, at 15:29 (UTC).